The NXP/Freescale i.MX 7 SoC which is the core of the Colibri iMX7 module implements a heterogeneous asymmetric architecture. Besides the main CPU core(s) based on the ARM Cortex-A7 processor, a secondary general purpose ARM Cortex-M4 core is available too. The secondary core typically runs a RTOS optimized for microcontrollers or a bare-metal application. Toradex provides FreeRTOS™, a free professional grade real-time operating system for microcontrollers, along with drivers and several examples which can be used on our Colibri iMX7 platform. The FreeRTOS™ port is based on NXP FreeRTOS BSP for i.MX 7. The Cortex-M4 CPU core lives side by side with the Cortex-A7 based primary CPU cores. Both CPU complexes have access to the same interconnect and hence have equally access to all peripherals (shared bus topology). 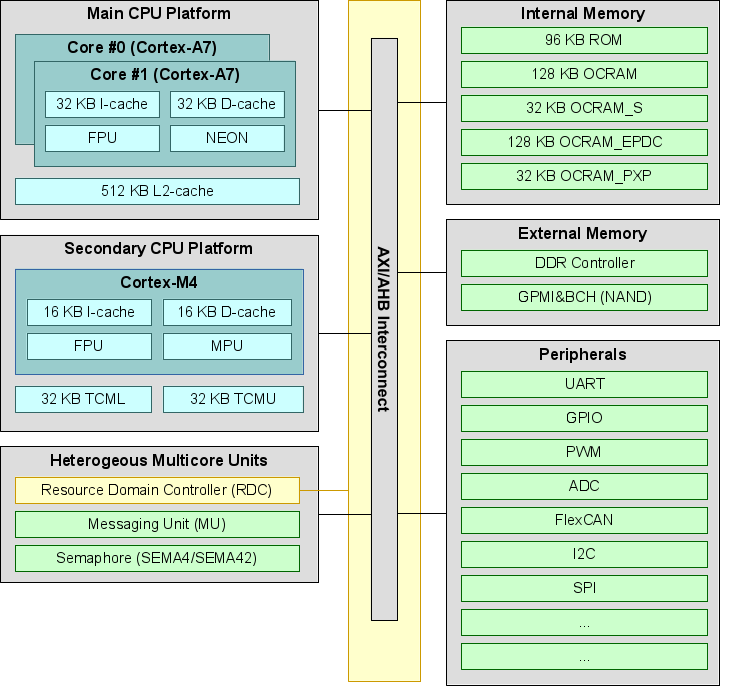 The graphic below is an incomplete and simplified drawing of the architecture with emphasis on the relevant sub systems to understand the heterogeneous asymmetric multicore architecture. A traditional microcontroller typically has internal NOR flash where the firmware is stored and executed from. This is not the case on Colibri iMX7: There is no NOR flash where the firmware can be flashed onto. Instead, the firmware needs to be stored on the mass storage device such as SD-card or the internal NAND flash. The available mass storage devices are not "memory mapped", and hence application can not be executed directly from any of the cores (no eXecuted-In-Place, XIP). Instead, code need to be loaded into one of the available memory sections before the CPU can start executing it. The i.MX 7 SoC always boots using the Cortex-A7 core. The core executes the internal boot ROM which typically loads a boot loader such as U-Boot. The boot loader allows loading the firmware from the mass storage device (e.g. NAND flash) into memory, and triggers the Cortex-M4 to start executing the firmware. To upgrade or replace a firmware, one can just replace the firmware binary on the mass storage device. The two CPU platforms use a different memory layout to access individual sub systems. This table lists some important areas and their memory location for each of the cores side by side. The full list can be found in the i.MX 7 reference manual. The Cortex-M4 CPU has two buses connected to the main interconnect (modified Harvard architecture). One bus is meant to fetch data (system bus) whereas the other bus is meant to fetch instructions (code bus). To get optimal performance, the program code should be located and linked for a region which is going to be fetched through the code bus, while the data area (e.g. bss or data section) should be located in a region which is fetched through the system bus. There are multiple example linker files in the platform/devices/MCIMX7D/linker/ sub directory which can be used and/or modified. All example firmware below use the MCIMX7D_M4_tcm.ld linker file (TCML region for code, and the TCMU region for data). all DDR memory. Allocating DDR memory for use by the M4, allocation in advance is required. 4kB of OCRAM starting at 0x00904000. Windows CEuses this memory only if SDMA is used (e.g. UARTs in DMA mode and Audio). Without SDMA, all OCRAM is free to be used by the M4 core. Understanding and configuring the Resource Domain Controller (RDC) is crucial when running two operating systems within iMX 7. The RDC prohibits and grants access to peripherals and memory areas for individual bus masters (e.g. CPU, DMA controller) on hardware level. The RDC allows to define up to 4 resource domains, and assign peripherals and memory locations to those resource domains. By default, the A7 core is in domain 0 and all peripherals are assign to the domain 0. When the FreeRTOS firmware start, the Cortex-M4 core is in domain 0 too, but then reassigns the Cortex-M4 and the required peripherals to domain 1 (see board.c and the example specific hardware_init.c). If a device shall be used on the Cortex-M4 which is used by the Linux kernel running on the Cortex-A7 (e.g. I2C), it is important to disable this device in the device tree of the Linux kernel (e.g. set the status property to disabled). The article Device Tree Customization explains in more details how to alter the device tree. Using GNU Makefiles and CMake along with the GCC compiler has been tested on Linux based host systems. GNU Makefiles and CMake can be used on a Windows systems by using MinGW. However, on Windows operating system using the ARM DS-5 IDE will be easier to setup and use (see below). ARM provides DS-5, an integrated development environment (IDE) suited for C/C++ development on ARM systems. DS-5 provides build capabilities similar to GNU Makefiles with GCC, but is also capable of debugging and profiling the application on actual hardware (through JTAG). Refer to our article Using ARM DS-5 IDE with Cortex-M4 of a Colibri iMX7. The FreeRTOS firmware uses Colibri UART_B (e.g. RS232 X25-Top on the Colibri Evaulation Board) as its debugging console. Make sure to connect UART_B to your debugging host and start a serial terminal emulator with a baudrate of 115200 on the serial port to see the FreeRTOS debug output. Some examples seem also to interfere with SPI, therefor the node ecspi3 might need to be disabled as well. Our BSP V2.6 Beta 2 and later provisioned a partition to store the Firmware directly on a static UBI partition and run it on boot. Note: This method only works for Colibri iMX7 modules which use raw NAND Flash storage. These are the modules with 256MB and 512MB RAM. Note: U-Boot 2016.11 sometimes seems to have issue when calling ubi part ubi multiple times (UBI volume corruption). Try to attach the UBI volume only once. Rather than using UBI, you may just write the M4 firmware to the VFAT partition alongside the Linux kernel and device tree and load it from there. This section provides information about the available examples and how to use them. The source code of the Colibri iMX7 examples is located under examples/imx7_colibri_m4/. All examples are linked to run in the TCM area. The (EXT_IO1) button is configured to trigger GPIO interrupt. Press the (EXT_IO1) button 3 times to continue. The (EXT_IO1) button state is now polled. Note: The interrupt part of the demo only works as long as Linux is not running. The reason for that is that Linux uses the same GPIO bank too, and reconfigures interrupts. The easiest way to use GPIO in interrupt mode on FreeRTOS while using Linux is to assign a complete GPIO bank to FreeRTOS and disabling the GPIO bank in Linux' device tree. [   61.598675] imx_rpmsg_tty rpmsg0: new channel: 0x400 -> 0x1! [   61.606640] Install rpmsg tty driver! This example uses the messaging mechanism to send an integer value back and forth, while incrementing it on both sites. The demo will stop after 100'000 iterations (that is when 200'000 incrementations have been executed). [   19.538184] imx_rpmsg_pingpong rpmsg0: new channel: 0x400 -> 0x1! [  330.056200] imx_rpmsg_pingpong rpmsg0: goodbye! Toradex toghether with AntMicro and Qt created a self balancing robot TAQ. You can see the robot in action in this video. The firmware has been built using an early version of the Colibri iMX7 BSP, hence the firmware might not run well with newer Linux BSP's. However, the API is pretty much unchanged therefor the source code can still be used as a reference. There are other examples available. Some of the examples run from DDR (_ddr) and hence require a different load/boot address as well as making sure that Linux not using that DDR memory. Some examples are Bare-Metal ((_bm) examples which do not use the FreeRTOS kernel while still using the driver/RPmsg framework. The heap size of FreeRTOS can be changed by altering the value defined by configTOTAL_HEAP_SIZE in the FreeRTOSConfig.h header file. However, the maximum size will depend on the available memory as defined in the linker file, which ultimately depends on which memory location is used (see Section Memory Areas). By default Linux is the RPmsg Master. The RPmsg master allocates the buffers, Linux does so in DDR3 memory. The location of the virtio_ring as well as the ring length and size of the buffers are currently hard-coded and must match between Linux and FreeRTOS. Furthermore, the ring length must be a power of two (256, 512, 1024...). Download the Toradex CE Libraries and build the Rpmsg_Demo application. Verify whether the M4 firmware is running by displaying the messages received from M4. Configure LoadAddr, the address into which the firmware needs to be loaded. Configure ExecuteAddr, the entry point instruction of the firmware. Please refer to the Memory areas section for more details. To troubleshoot Linux problems (e.g. when booting Linux, after starting the firmware hangs), the kernel's earlyprintk mechanism can help. Often the kernel does actually start booting; however, just before the serial port (and hence the serial console) initializes, the kernel crashes. The earlyprintk mechanism starts printing kernel log messages from the very beginning. The earlyprintk functionality is not part of the default kernel and hence needs to be enabled in the kernel configuration (see also Build U-Boot and Linux Kernel from Source Code). To resolve this, make sure to not access the same peripheral on the primary and secondary CPU.